Marthy Coumans has been mentioned before in this Soundtrack, but to do justice to him, I should mention him at least once a week. And several other people too, so you get the problem. But last week I received a tape with some of his best French 45’s that he added to his massive collection recently. 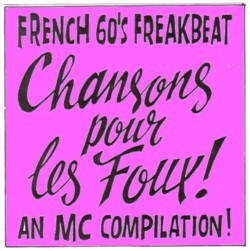 I have given most of my French collection away after the compilation LP’s and CD’s entered the market. Series like Ils sont fou, les Gaulois make my own collection not worth the space they take on my shelves. But that is different for the French records that Marthy brings home. To give you an idea of what I mean, I will give the titles of ten songs on this compilation: Marie-Juana, L’Automate, Invasion Martiens, Haschisch faction, Le KluKlux Klan, Astronef 328, Le cri de cemetire, Bzh, Juxtaposition and Je bois trop . I am not jealous of Marthy. He has to visit at least three flea markets each week, spend large amounts of money, work his way through ton loads of crap records, and to make tapes of all the best songs for me. All I have to do is to put his tapes in my tape player and enjoy this mind boggling music. Here is Robert Caire with Invasion Martiens . A nice addition to the Napoleon 14th Archives , about which more later in this Soundtrack.